"We are doing something that few previously thought was possible," said Contreras-Vidal, who is also an affiliate professor in Maryland's Fischell Department of Bioengineering and the university's Neuroscience and Cognitive Science Program. 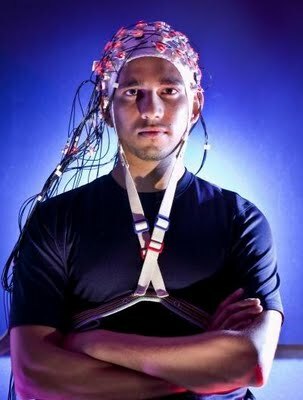 "We use EEG [electroencephalography] to non-invasively read brain waves and translate them into movement commands for computers and other devices. Alessandro Presacco, a second-year doctoral student in Contreras-Vidal's Neural Engineering and Smart Prosthetics Lab, Contreras-Vidal and co-authors write that their Journal of Neurophysiology study indicated "that EEG signals can be used to study the cortical dynamics of walking and to develop brain-machine interfaces aimed at restoring human gait function." Contreras-Vidal and his team are collaborating on a rapidly growing cadre projects with researchers at other institutions to develop thought-controlled robotic prosthetics that can assist victims of injury and stroke. Their latest partnership is supported by a new $1.2 million NSF grant. Under this grant, Contreras-Vidal's Maryland team is embarking on a four-year project with researchers at Rice University, the University of Michigan and Drexel University to design a prosthetic arm that amputees can control directly with their brains, and which will allow users to feel what their robotic arm touches.